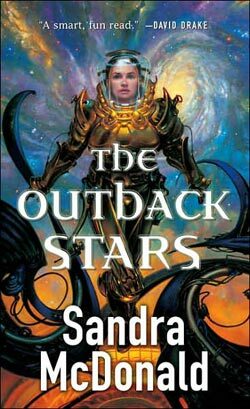 This week’s Danger Gal Friday post profiles Lt. Jodenny Scott from Sandra McDonald’s THE OUTBACK STARS. Ships in Scott’s world travel faster than light via an ancient alien system called the Alcheringa. Earth’s climate has been decimated, though some unfortunate people still live there. Many have colonized seven planets called the Seven Sisters. The mythology of the story is taken from Aboriginal Australian mythology and explained by the fact that Australians were the first to discover the Alcheringa and therefore the first to colonize the Seven Sisters, though no one yet has discovered the purpose of three spheres found on each planet called the Mother, Father, and Child Spheres. Scott definitely qualifies as a Danger Gal in that she’s a decorated officer and, once joining the Yangtze, is put in charge of Underway Stores, the department responsible for all supplies across the entire ship. I thought the Romance and Science Fiction elements were well-balanced and the plot well-executed, but I also admired McDonald’s obvious knowledge of daily life on a Naval vessel. Her bio states that McDonald has in fact served as an officer in the United States Navy and this life experience definitely comes across in the main details of the story. While fraternization between officers and enlisted is not permitted, it’s clear that in Scott’s world women and men enjoy quite an egalitarian approach to sexuality, though other modes of approach are not extinct. For instance, one female character is suspected of exchanging sexual favors for gifts and another female character is in an abusive relationship. However, Scott encourages the first character to give up her situation because of how it may impact on her career — no mention is made of anyone’s aspirations on the woman’s moral character. The woman in the abusive relationship is helped by several characters, including Scott and Myell. In a reversal of many Romances I’ve read, it’s the hero, Myell, who has to deal with past physical abuse rather than the heroine. Scott has had her trials and tribulations, but none of them include the stereotypical tropes often given to female characters to support an unwillingness to consider a new romantic relationship. Throughout the story Scott outranks Myell, but never does he demonstrate a problem reporting to a woman or following orders given by her. Scott has emotional baggage to deal with from her losses on board the Yangtze, but her efforts to continue on despite them show a sense of admirable determination. My only criticism in this area is that Scott considers and voices the possibility of giving up her commission in order to continue their relationship, but Myell never talks of making a similar sacrifice. In his defense, Myell is against Scott resigning and before having met her decided he would leave the military when his contract expired in three months. I appreciated that many of Scott’s and Myell’s superior officers were women, including a very important admiral. Also the Aral Sea is comprised of a multicultural crew that I found refreshing. Overall I very much enjoyed THE OUTBACK STARS, relished reading about Scott’s adventures, and look forward to the next installment in the series. Another for my To Read list! Thanks! Thanks for the shout-out! 🙂 It was a fun novel to write, and I’m always happy to see people talking about it and enjoying it.